This week’s Blog prompt is a nice one. Timely, even. Do I like writing AUs? Of course! It’s fun in a number of ways. From the direct and obvious ways (taking my characters and twisting them into horrible versions of themselves) to taking a one off setting and expanding it into a full blown things (like I did with my Paths Not Taken story and the Borg rules all AU). Picking a place to start, however, is tricky. AUs are only as good as the characters in them, like just about anything in Star Trek. I’ve recently been reading Star Trek Mirror Universe: Rise Like Lions and I’ve been thoroughly impressed with the way the novel is constructed and the scenarios presented. Do I agree with the way some of these things happened? No. I find some of them too convenient and others far too similar to the Federation in the primeverse. Too often I feel AUs are destined to try and resemble the primeverse. I dislike that notion but I very much liked this book and so I used it as my guide, in a way, to formulate my own series of MU stories that take place before, concurrently, and after Star Trek Chronicles: Book III. The new series, Star Trek Chronicles: Birth of Hope is set at various points between 2378 and 2385, culminating in the next big plot for the Chronicles universe that will take place over a number of years. This series of stories is going to be massively fun to write. 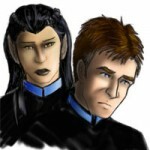 I like twisted and dark and the mirror universe has that in abundance. What it doesn’t have a lot of is hope. Or good writing. I’ve reviewed the majority of mirror universe episodes over the course of the last few days (especially DS9’s eps as they immediately set the stage for what’s progressing in the MU) and I’ve found the characters to be two dimensional and a bit flat. DS9’s always getting praised for its amazing writing but I found the writers really didn’t do a good job on the mirror episodes. Where depth and direction should have been they replaced with cliched double-crosses, betrayals, and lots of death. I get that the MU is violent and a nasty place, but there’s order to that chaos. An order that was clearly present in MU eps in “Mirror, Mirror” and “In a Mirror Darkly” but was lacking in DS9s time. I suppose the lack of a Terran Empire could be attributed to this loss of order but the MU eps in DS9 felt kinda lazy. And they’re not really enjoyable, just a bit cringe worthy. But, hey, that’s canon and I can roll with that. How I started was pretty simple: I needed an event to be a chain reaction point. A point where something had to change. Now, I could have based this exclusively in the MU but as we’ve seen in every MU episode, the primeverse and MU are weirdly connected. One plays into the other and so I decided to use an event in the primeverse to set off a series of events in the MU. A series of events which the primeverse will be unaware of for the most part. As to the writing of the MU, you have to acknowledge the differences in language and perception of things. But in that acknowledgement you have to recognize that the characters are 3-D being and shouldn’t be written like anti-hero/villain cliches which DS9 did very often in its MU episodes. The MU requires, IMO (all of this falls under that), depth and direction. It requires actual characters. I plan on giving it that and I feel I’m well on my way to making up for the various shortcomings I perceive in the way the MU has been treated by modern Trek.